Thanks to Jalen for sharing and be sure to submit your own pictures and especially fan art! Yea it looks like a Viper with a widebody kit. so its a viper with different badges? 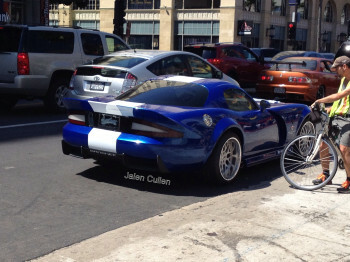 Real Life Bravado Banshee Cruising Around - GTA fan Jalen Cullen manages to snap some pics of Rockstar's upcoming prize as it hits the streets.